3 blocks to beach! Arcade machines, pool, wireless internet! This condo is equipped with a large wall mounted 42' flat screen LCD TV and two real arcade machines (set for free-play). One packs 60 classic arcade games such as Ms. Pacman, Frogger, Donkey Kong, Millipede, Arkanoid, Dig Dug, Space Invaders, Zaxxon, Galaga, and many others. The other is a Nintendo Playchoice-10 that includes Super Mario Bros., Duck-Hunt, Mike Tyson's Punchout, Contra, Rad Racer, Gauntlet, Kung Fu, Ninja Gaiden, and two others. The condo includes access to the on-site pool, and is only three blocks from the beach and convention center. Cable TV and Blu-Ray DVD are equipped in the living room on the 42' LCD flatscreen. There is also plenty of local activity, as the boardwalk, amusement piers, convention center, and beach are a few block's walk. Atlantic City is also just a short drive away. This condo features a full kitchenette, and a roomy bedroom with a twin top bunk, full bottom bunk, and a lower twin trundle bed. The living room is equipped with a very comfy wrap-around sectional sofa that includes a recliner and a pull out bed that sleeps two adults. Vacation rental amenities: Arcade machines w/60 classic games and 10 classic Nintendo games, wireless internet, 42' flat screen LCD TV, cable, DVD/VCE, pool w/ kiddie pool, boardwalk, restaurants, beach within a few blocks. Wildwood's bayside offers boating, fishing, and jet skiing opportunities. Historic Cape May just a trip over the bridge! Very close to Atlantic City! No smoking or pets please. Also, condo association rules stipulate no groups under 25 years of age, sorry. Me and my sister, who also owns a condo in Wildwood, and who inspired me to step out and buy one too :). The first day I visited these condos I decided to buy one, as I loved the atmosphere. Physically, I liked the breezy, laid-back, comfy feeling. Yet, there was also a sense of energy and excitement in the air that makes Wildwood exciting. I like the amenities that I've added to my unit, such as the arcade machines, 42' flat screen, wireless internet. Beyond that, I just love the intangible sense of peace and relaxation that I feel there. It's like the stresses of life just don't exist when I'm there. I wish I didn't have to work in the summer and could just personally stay all summer long in Wildwood, but for now I'm renting out most summer weeks, and only using several for my own personal vacation time :). 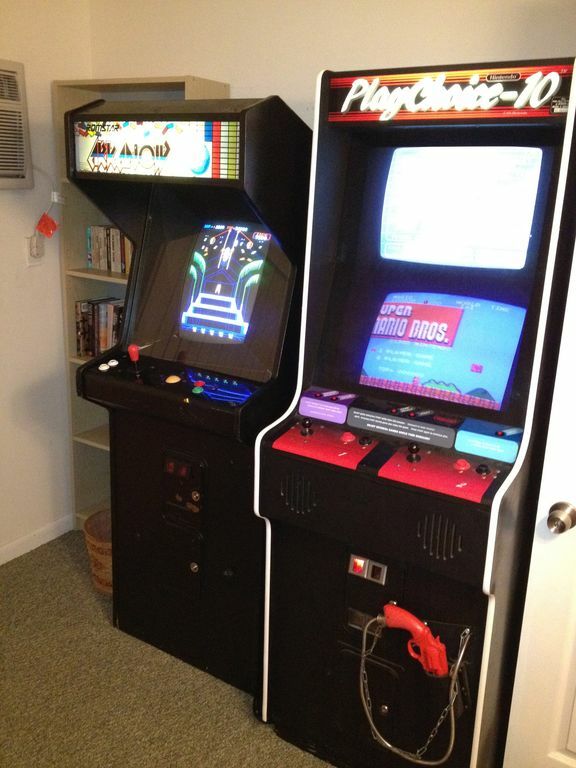 Two full-size arcade machines in gaming area of the bedroom. My 10 year old daughter and I had a wonderful time here. It was nice and clean, and it was perfect having the 2 arcade games, as it rained a good portion of the weekend. Would definitely stay here again. Locking and unlocking the door was a bit of a challenge at first but the weather was very humid which was probably what made it difficult. An awesome selection of books and the video games were a trip. I’m an 80s girl so I really enjoyed having my kids experience miss Pac-Man and donkey Kong. The mattresses were super comfortable and the Decour is beautiful. Very convenient to everything in walking distance and the pool was very nice. I highly recommend this place. Absolutely perfect for our 1st family vacay as a family of 4!!! We couldn't have been happier with our experience in this unit! Everything we needed in a prime location! The arcade games were a def hit with my 5 year old son! Thank you so much for allowing us this amazing and ever so memorable experience! The building was clean, the location couldn't be better and the neighbors were so polite and informative! A definite A++ . Would recommend a million times over and already discussing planning a return trip! The unit is small, but comfortable and clean. It is well maintained and our basic needs were met. A TV in the bedroom would have been nice, but we took our own and our laptop and I was a happy camper. We had lots of fun on the arcade machines too. Very good place to stay. The owner is really Nice always helping me answer all questions ans give good advices. Thank Mark. The condo was nice, well kept and had all the accommodations as home. The condo offered cable, WiFi and video games which the children enjoyed immensely. 3 blocks from the Wildwood Convention Center and Boardwalk which has unlimited attractions, amusement parks, etc...also just a short drive to Atlantic City!